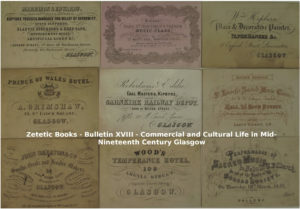 The first Bulletin of the year, on the first day of the year, is Bulletin XVIII, a collection of trade cards and tickets, illustrating the commercial and cultural life of mid-nineteenth century Glasgow. Almost from the cradle to the grave, we find amongst others, trade cards for tailors, sail makers, shoe makers, boiler makers, taverns, cabinet makers, confectioners, lithographers, painters, paper hangers and undertakers. Cultural pursuits include musical concerts, art exhibitions, soirees, educational classes, philosophy and art classes.